Brand Clarity Workshop - Live! Create your own inspiring brand! Are you feeling a wee bit lost and confused about how to create a powerful brand for your business? Do you "know" that good branding can make a BIG impact on your bottom line, but you have no idea where to begin? Have you been all over the freakin' place trying to figure out what your brand should be, but the more things you try, the more confused you seem to get? Whether you're just starting out with a brand new business, or you want to revamp or better clarify your current brand, this course is for you! The Brand Clarity Workshop will walk you step-by-step through creating your own amazing brand. We start on October 15th - each day you'll have a lesson or a specific action to take that will leave you with a complete brand at the end of our 2 weeks of working together. What are the key elements of an effective brand? Create your own personalized branding guide to help you stay true and "on brand"
Brand clarity is the key to YOU feeling empowered as a business owner. You can attend all or none of the live trainings. They are designed to dig deeper into the course work, provide coaching, feedback and give you extra support while you create your **amazing** brand. All of the calls will be recorded and you can submit questions before hand if you know you can't join us live. We're going to go over the fundamentals of what makes a great brand and how to build a solid foundation for YOUR brand. Explore how knowing your DREAM CLIENT will help you grow your business faster and easier. You'll get super clear about YOUR dream client. This live class will cover how to craft a compelling brand message that showcases the unique vibe and personality of YOUR business. 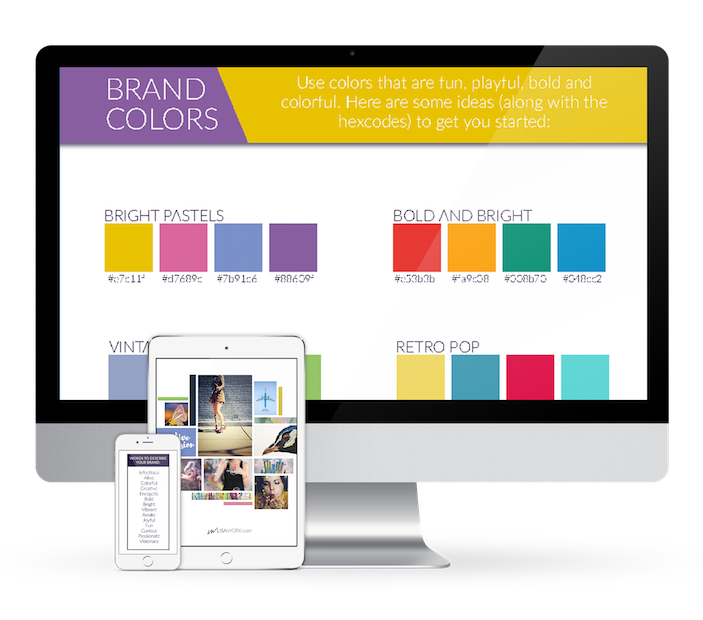 How to choose your brand colors, your fonts, and the imagery that will perfectly showcase the vibe of your brand. Learn how to create your own logo, even if you've never designed anything before and without fancy design software. You can do it! On today's call, we're going to talk about how to use and apply your brand so that you'll feel confident showing off what you've created! Create your own amazing brand! FINALLY... GET YOUR BRAND DONE!